With all that in the bag, we will be busy over the next few weeks and months and are all really curious what the data will tell us in detail. 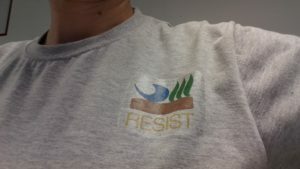 Been there…, seen it…, got the t-shirt! 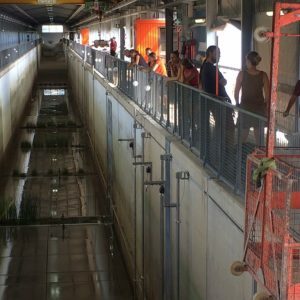 But with the last waves of the experiments losing their energy at the beach at the end of the flume our time at FZK comes to an end. 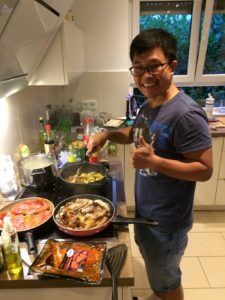 It has been an interesting, challenging, but also rewarding experience for us all – not only in the flume but also in our self-catering accommodation, where the students and post-docs have been pulling together to put on some amazing meals. 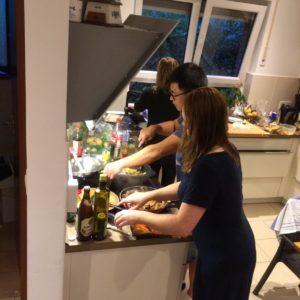 Whether in the flume or in the kitchen, this is a well-oiled team! … and a well-oiled team makes it easier! A relaxed team generates good ideas! 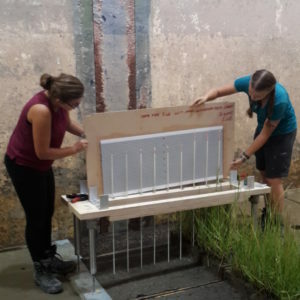 This type of experiment is hard work for everyone, with 10-12 hours per day spent preparing the pallets, doing the daily measurements, typing up and archiving data, and sampling the pallets again once they come out of the flume. 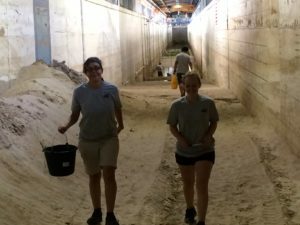 Over the next few days, everybody will go home and, to be honest, feel somewhat relieved… (especially the team members who have been on site for the entire time). 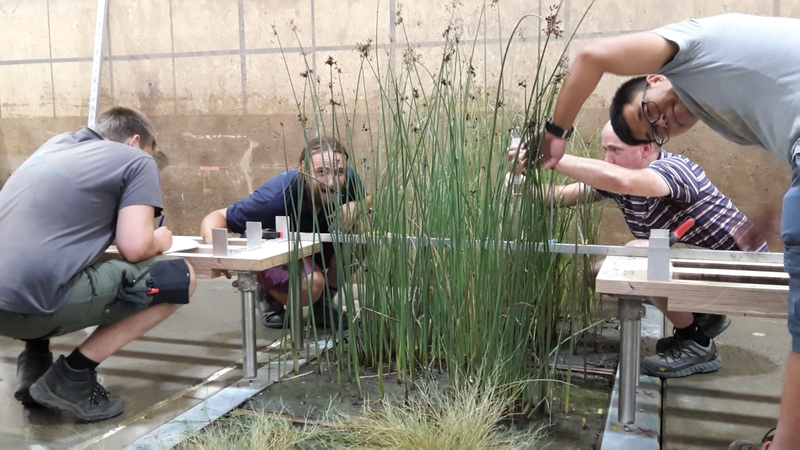 We look forward to getting together again in a few month’s time, however, to discuss what the results mean – and most of all how our results improve the way in which we manage coastal salt marshes and their important role as natural coastal protection against wave impact. Just like after the experiments in 2013, we will keep you posted on our findings, albeit not as frequently as over the last few weeks. So keep checking this page for updates. 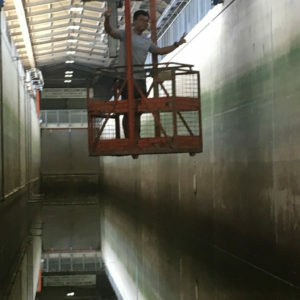 The large wave flume is a unique facility and thus the experiments conducted there are unique as well. Over 30 years since its opening mean that it has seen a lot and the FZK team can draw from a lot of experience. But still, there are things that happen for the first time ever. In our case, it was the music that was playing from a speaker that we took down to the platform every afternoon when we did our measurements. As someone from the FZK team said: in the past, engineers would just go down and get the job done. 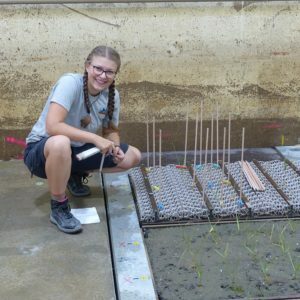 Well, biologists also want to get the job done, but they realise that the job at hand is much more fun with the RESIST flume playlist running in the background. 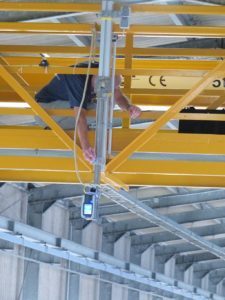 We produce a laser show every day (though not quite disco style…): We are using a laser scanner that gets fixed to one of the cranes to map the surface of our pallets and from comparison between recordings we will calculate height differences and thus measure erosion. 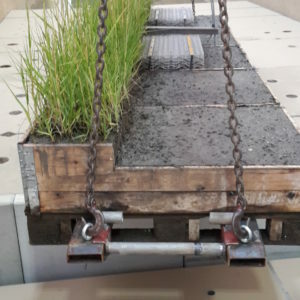 The approach is similar to the structure from motion images that we are taking, but given that questions about soil stability are at the centre of these experiments we cannot have too much data on it. 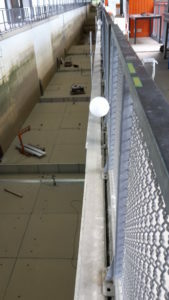 To match images from laser scans of different days, white spheres are mounted on the side of the flume, which will appear on each scan and will be used to align them. 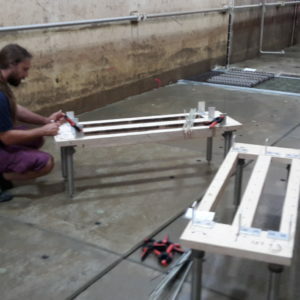 And to get the highest precision possible, the FZK team build a calibration board that we placed in the flume and scanned in addition to the plant pallets. Unfortunately, this laser is so strong that is can damage eyes, which is why our laser show has to take place once the music and all people have left the flume. 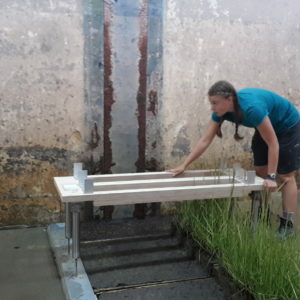 A lot of our measurements take place in the afternoon, when the flume is drained and we can access the platform to check on the plants and soil. 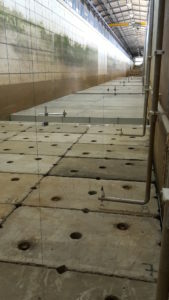 But we also have a suite of instruments installed in the flume to record conditions during the wave runs. 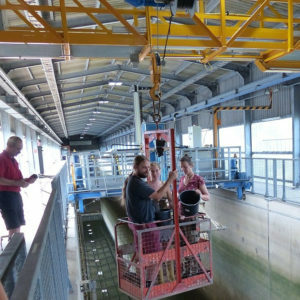 A very essential set of instruments are the wave gauges which we use to record the incoming waves and also assess how waves changed due to breaking from the front to the back of the flume. Furthermore, some of these wave gauges report back their data directly to the wave maker which then is able to directly correct for any potential wave reflection and thus makes the cleanest possible waves for us. The wave gauges measure water level variations but what we are really interested in, are the conditions at the bed. 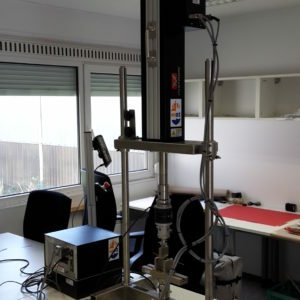 That is why we also installed instruments that measure the flow velocities close to the bed. Acoustic Doppler velocimeters (ADVs) send out a very high frequency acoustic signal that is reflected from particles in the water. The Doppler effect causes the frequency of this signal to change depending on the particle’s speed and the instrument is capable of calculating this velocity from the sent and received signal. 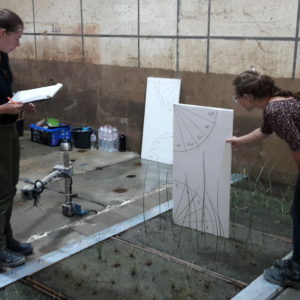 This data will tell us what flow conditions the plants and soil encounter as it is these conditions that drive the changes we observe each afternoon. 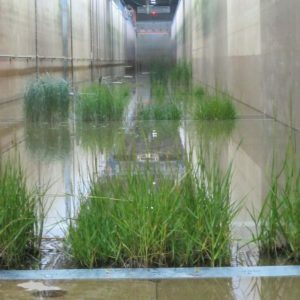 This flow induces drag forces on the plants which cause them to sway back and forth and may even damage them. To assess these forces, we installed an additional set of instruments, so called drag sensors. 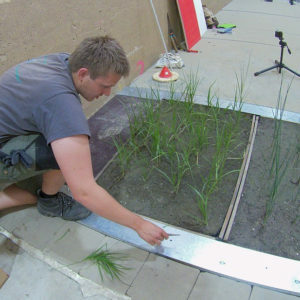 The force measurements require the plants to be cut from their roots and fixed onto the sensors. 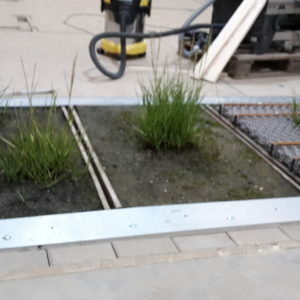 And since even hardy salt marsh plants do not last very long when they get cut off, we attach new plants every morning before the water floods the flume. 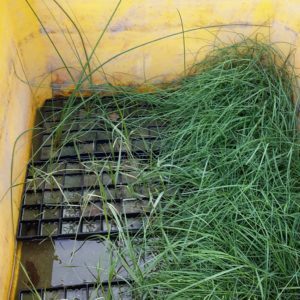 Here the spare seedlings that we brought for the Instron come in handy as they give us enough fresh plant material for each day of experiments. 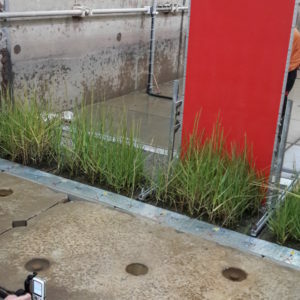 Each sensor has a seedling of a different plant species attached to it and we measure its dimensions carefully before they get attached to the sensor. Comparison between the plants and their drag data will help us to answer questions such as: Up to which wave forcing does each of the species still withstand the forces and when do the stems break? How are the forces related to shape and other plant properties? Especially the latter can only be answered if we combine information from the drag sensors, the ADV and the Instron, which once more shows how important it is that the different disciplines involved in this project work closely together. 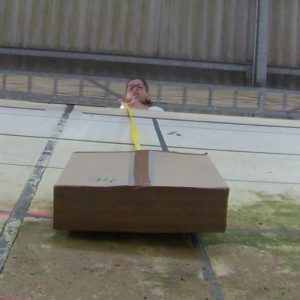 The fact that this interdisciplinary cooperation works really well makes this fantastic experiment very special and really fun to work on. 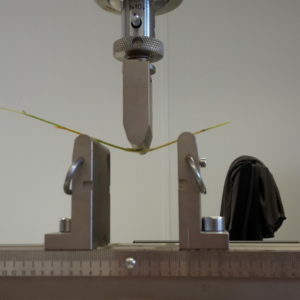 Such large experiments are not possible without heavy machinery. First of all, there is the roughly 1000 horse power wave maker which enables us to produce our artificial storm floods. 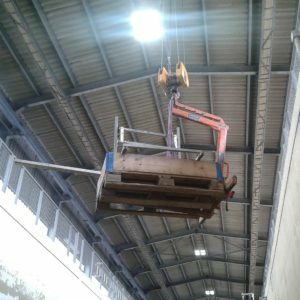 But we are also grateful for the two portal cranes which transport the pallets into the flume, lift our measuring equipment in and out every day and make for a great commute to work. The forklift truck that transports pallets outside the flume almost looks small compared to these heavy weights, but is equally important. For all these machines insurance companies insist on special training and they can thus only be operated by the FZK team. But there is one impressive machine that we run ourselves. 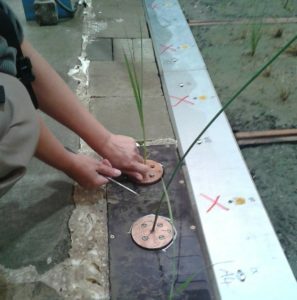 The ‘Instron’ is a multipurpose device which we use to measure stiffness of the plant stems using a three-point-bending test. 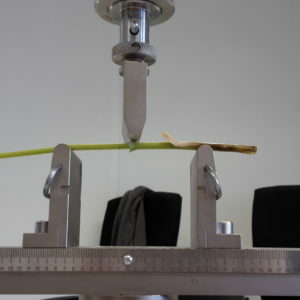 During this test, a bar pushes down onto the middle of a piece of plant stem and the Instron measures how hard it needs to push to achieve a defined distance downwards. 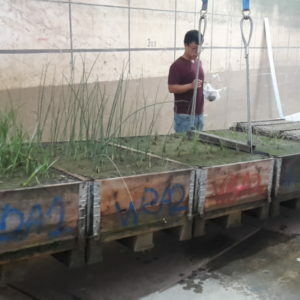 By testing a subset of plants at the beginning and end of each week, we will get a feel for any changes in stiffness that may have been caused by the four storm wave conditions we expose the plants to each week in the wave flume. 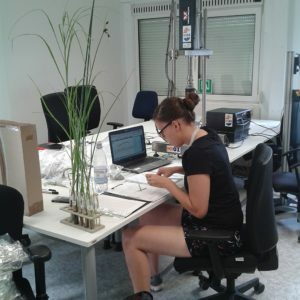 Additionally, it will help us to interpret any response differences between plant species that we observe after each test run. It needs a fair amount of samples to detect any differences between species in all the natural scatter. 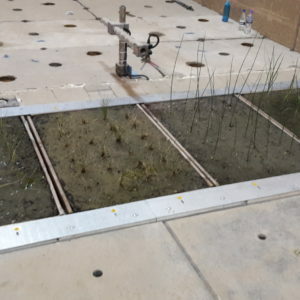 And because we only have a limited amount of seedlings in the flume, we brought some spares which were grown under the same conditions to produce sufficient data for robust statistical analysis and to keep the Instron busy. 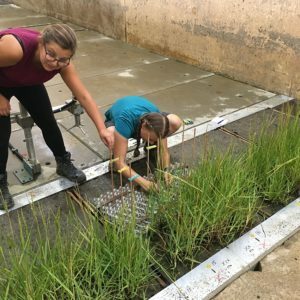 This project would not be possible without all the highly motivated young people in the team who do most of the counting and measuring and weeding and cutting. And while it is hard work, particularly in this heat, it is safe to say that none of them is regretting getting involved so far. After all, it is a great opportunity to work in an international and interdisciplinary team and a fantastic experience to work in such a large and unique facility. 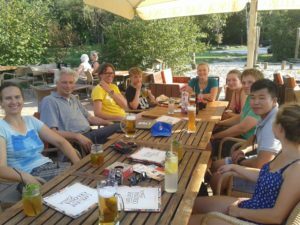 They will all get an amazing dataset out of this project which will keep them busy over the next few months and will form the basis for their dissertations and theses. But we are also thinking about the young plants, which often grow on the very forefront of salt marshes. 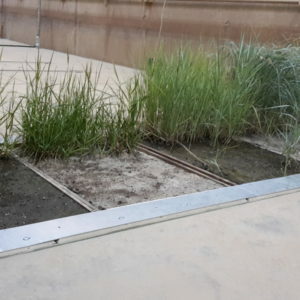 In this exposed location and without sheltering older plants around them their life is harsh, which is why we dedicated a complete experimental zone to them. 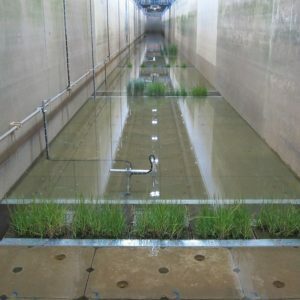 Here we perform the same measurements than in all other zones, but because the seedlings stand separated from each other, it is much easier to see how the different plant species respond differently to the wave forcing. 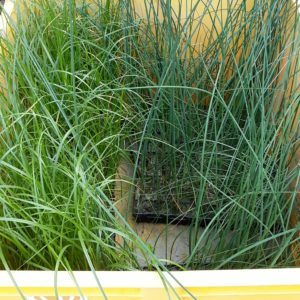 The seedlings that we use have been grown from seeds this spring just like seeds would germinate in nature. However, out there a precondition of germination is that the seeds stay in one place long enough to germinate and take root. 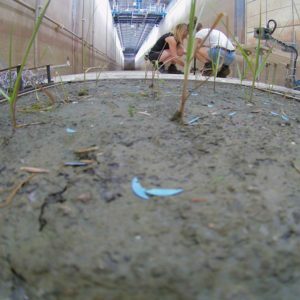 We therefore are also addressing the question how seeds actually survive storm waves on the sediment surface. And since brown salt marsh seeds are really hard to see on brown salt marsh soil, we use mimics that have a similar shape and weight but are much better to see. They may appear like remnants of a party, but they have been placed with great care! 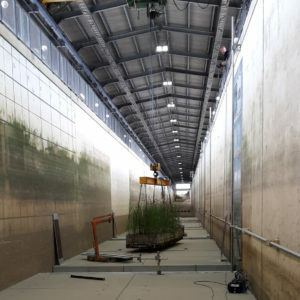 …as a total of ten journalists and photographers followed our invitation for a press day last week taking the opportunity to ask questions about the experiment, the previous one we did five years ago here in the large wave flume, and the functions and services of salt marshes in general. 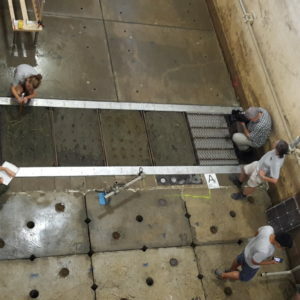 We then opened the flume floor to the cameras while our daily measurements were underway. 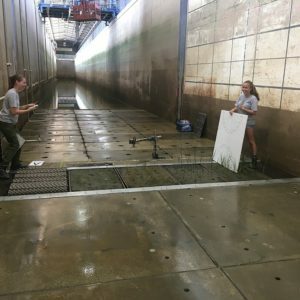 It made an exciting afternoon for both us scientists who were suddenly facing a TV camera and the camera man who had never travelled by crane before. And it was certainly worth it. The local newspapers reported on our study both on Friday and Saturday last week and we made it into the regional TV programme. The feature on the national radio will be available for download until 23. February 2019, so if your German is not yet up to scratch to understand all of our press coverage, there is still time to catch up. 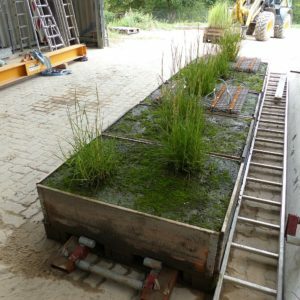 Besides the plant pallets on the raised platform, we also install a row of soil cores at the back of the flume each week. 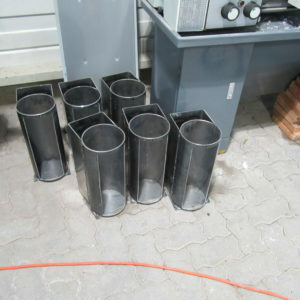 To do so, the FZK team especially designed and built the steel ‘flower pots’ that take the cores and expose their vertical side to the approaching waves. 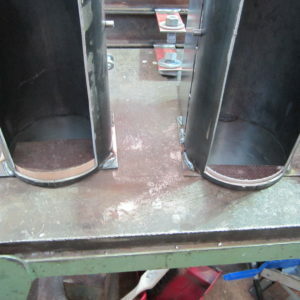 To save us time during flume filling every morning, we drain the water only to a height just below the cores. 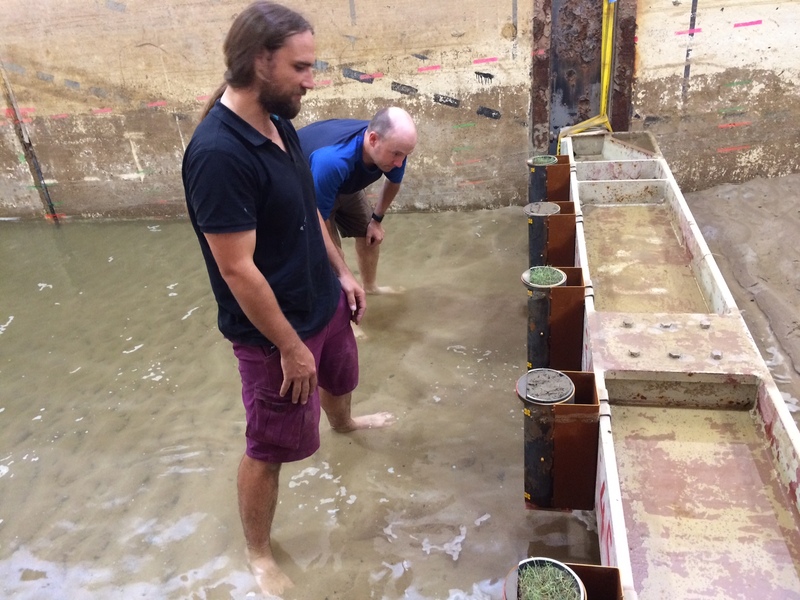 Given the water temperatures above 20 degrees and air temperatures even higher, nobody minds this high water level when checking on the cores. 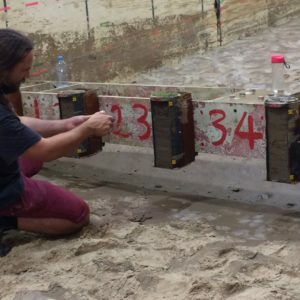 We use the cores to look at the effect of storm wave attack on exposed vertical sections of sediment representing marsh cliffs. Each week we install six 40cm deep cores with faces exposed to the waves. The cores are from two sites in the UK with contrasting sedimentology – one is sandy, while the other is finer and more cohesive. The cores, extracted as part of the NERC funded RESIST-UK project, have been scanned using a micro-CT scanner so that we can look at their internal structure: lamination, pore spaces, root networks and so forth. 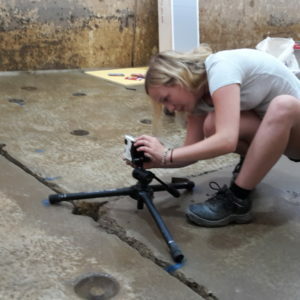 We hope that we will then be able to map the erosion that we observe under storm conditions to specific structural characteristics within the sediment. 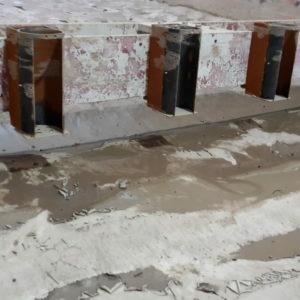 Given that the area where erosion may take place on these cores is vertical, the SET tables cannot be applied. But the SFM method applies here just as well and will give us detailed information how the cores responded to the wave conditions. 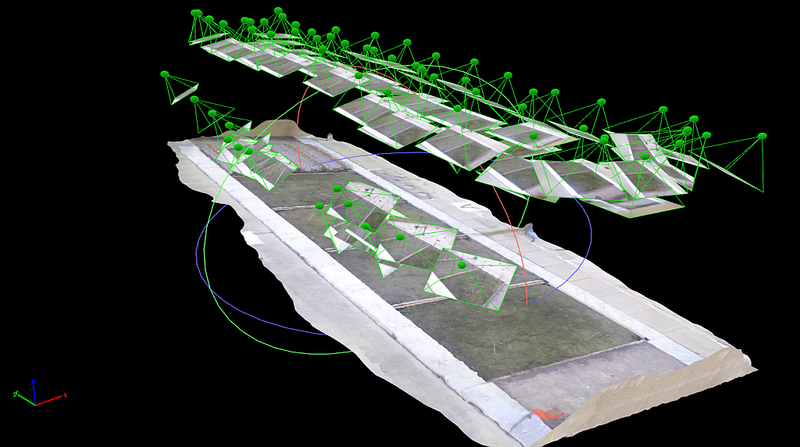 During the coming years of RESIST-UK we will also tie these characteristics to the surface vegetation and sediment characteristics that we can map from drones in the field. 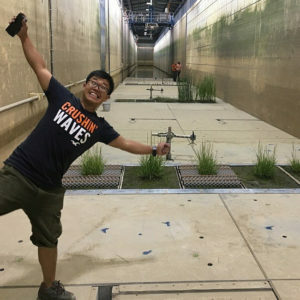 We will thereby build a link between features that we can see from the air and the vulnerability of the underlying sediments to storm waves, allowing us to make spatial predictions of marsh edge stability that complement the findings for the marsh surfaces that come from the rest of the experiment. 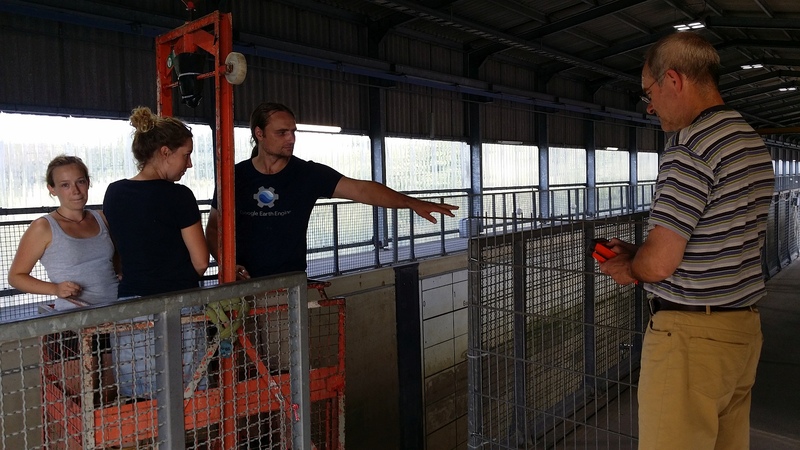 During the course of the week, we have been constantly increasing the wave conditions that our plants get exposed to: the last wave spectrum of the week finally also contained some waves that spectacularly broke and washed white water across our setup. 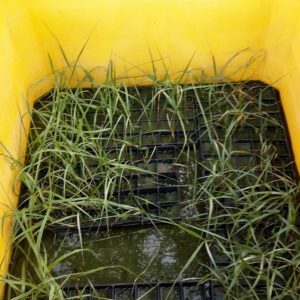 We were surprised how little biomass came floating up to the surface, but now cannot wait to see what these conditions did to the plants and soil. 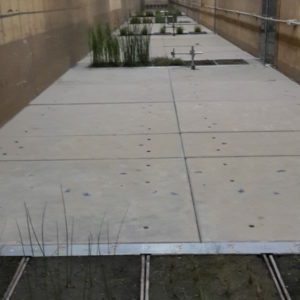 It has to be said, having the plants in the flume simply looks beautiful. 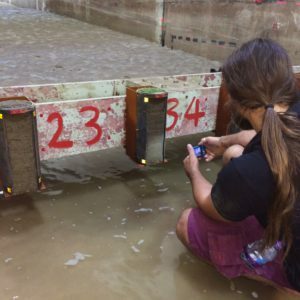 And on the first day, when the water very slowly rose so as not to disturb the sediment surface while flooding the pallets, we could not stop admiring them and taking pictures of them until we almost got wet feet. 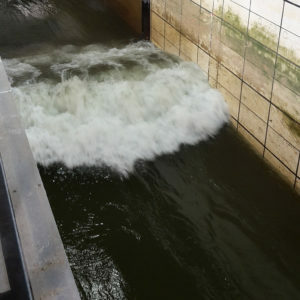 Once the flume was filled to the desired height, we switched on the instruments, started the waves and hoped for the best. The water was exceptionally clear for GWK standards, but still not clear enough to see in detail what was going on at the bed while the waves were running. 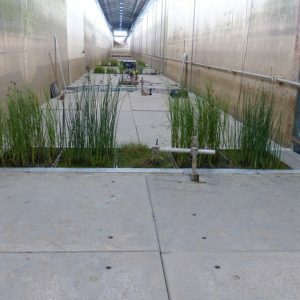 The slow and careful draining process then meant even more waiting time until we could finally see the plants and surface again and started the first post-experimental measurements in high spirits. 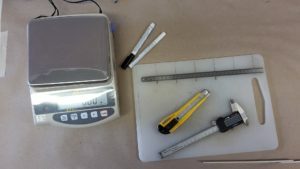 One of the core sets of measurements that will be performed everyday are SET measurements. 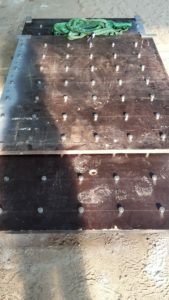 SET stands for sediment erosion table and it will give us detailed information on how the surface elevation of each pallet changes as a result of a wave run. 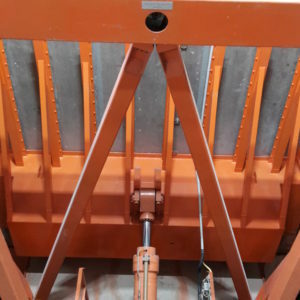 The different plant heights and pallet configurations require slightly different setups in order not to bend the plants, but the method is always the same: A table or bar of a defined height is placed across the pallet which has a line of holes it is. 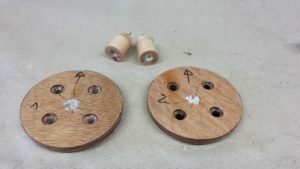 We then feed pins through these holes until they just touch the sediment surface, fix them in position and read their height with graph paper. 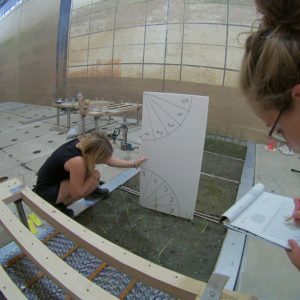 While an individual reading will not tell us a lot, comparison between the daily measurements will tell us exactly how the surface has changed. 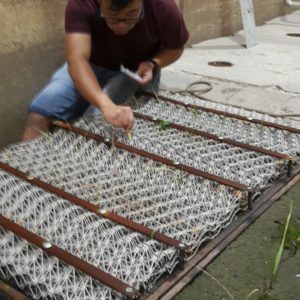 To ensure that we always measure in exactly the same locations, the FZK team had prepared tables whose feet precisely fit into holes in the metal bars that hold down the pallets. 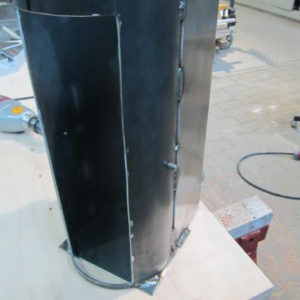 The fact that they thought about these holes when they designed the metal bars shows once more the team’s fantastic skills when it comes to designing experimental setups. 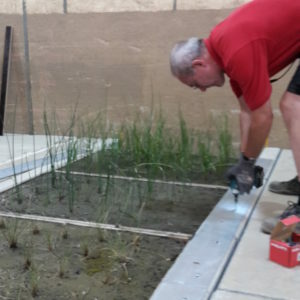 It has been a busy Monday at GWK with the installation of the first set of plant pallets in the flume, last minute adjustments and the first reference measurements for plant and soil surface parameters. 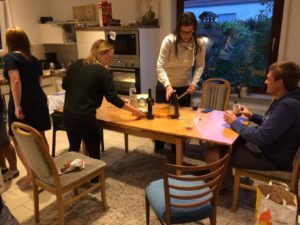 Of course everything took longer than during the trial last week, but given that something like this has never been done before, the detailed planning paid off and it all went smoothly. 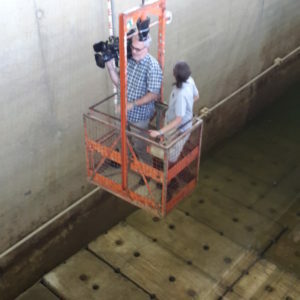 The pallets were arranged in predefined rows and then graciously hovered (by hoist) into the flume. 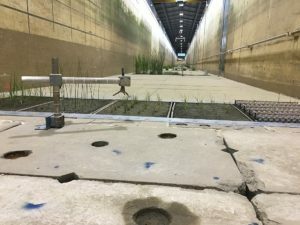 Once set in their dedicated slots in the concrete platform, they were fixed with metal plates to ensure a smooth transition from the surrounding concrete to the pallet’s soil. 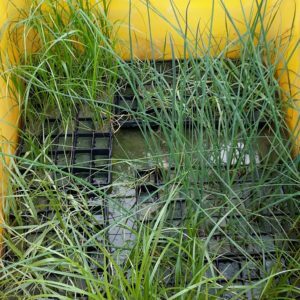 At the end of the day, the five rows of plant pallets, all representing different stages of salt marsh development from individual seedlings, via tussocks and closed canopies to small cliffs, were installed. 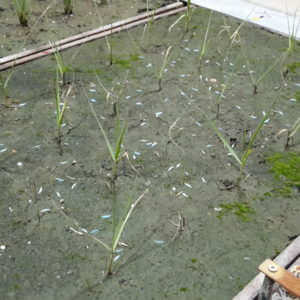 In addition, some of the rows are also composed of different plant species which are typical for brackish or more saline marshes. 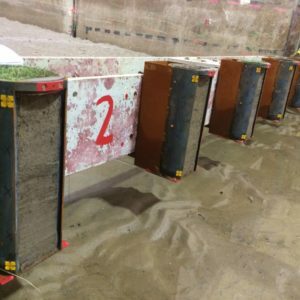 And some of the pallets are covered with biodegradable grates designed to provide protection from erosion. 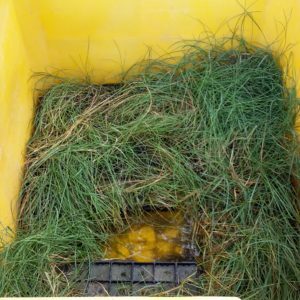 This broad spectrum of species and development stages will allow us to determine the soil stabilising potential of salt marshes and results will be applicable to a broad range of brackish and saline marshes in northern Europe. 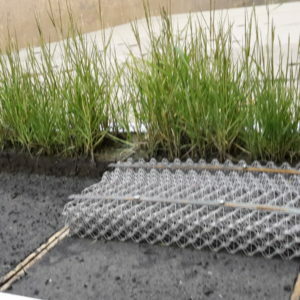 Although the overall focus of these experiments in on soil stability, we are fully aware that the waves will not simply pass by the plants without any effect. 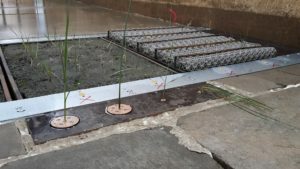 For this reason we are determining plant parameters such as biomass distribution (both in the horizontal and in the vertical) and the angle at which the seedlings protrude from the soil’s surface. 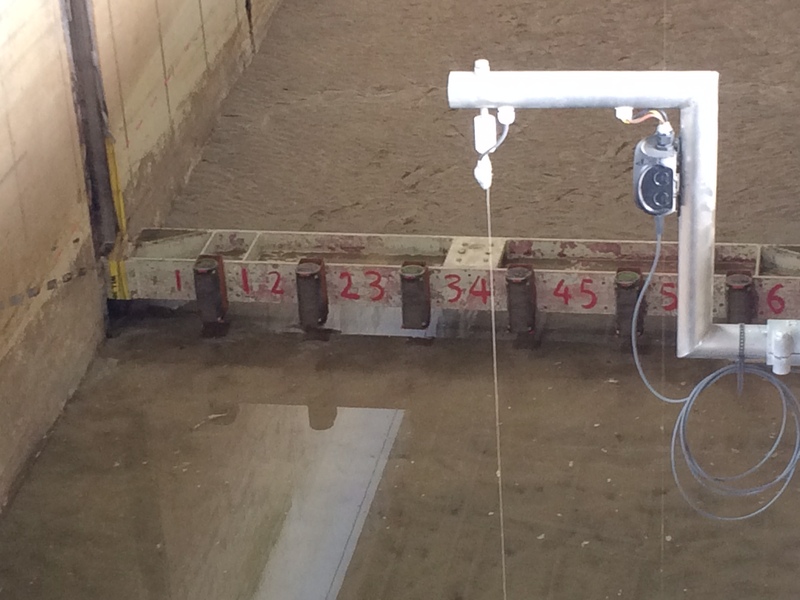 These measurements get done prior to the first test and then after each experimental run. 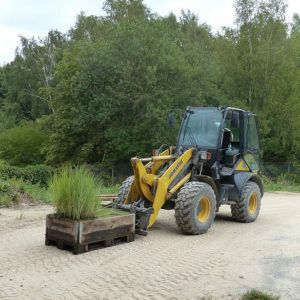 It will be exciting to assess how the above ground biomass of plants is changing during the course of our experiments.